Directors: Tim Minear, Fred Keller, etc. Following an erratic and patchy first season, Angel returned with a more distinct and legitimate identity of its own, and finally cut the Buffy The Vampire Slayer umbilical cord. Fox’s Region 2 release of Season Two gives viewers an opportunity to see the series in 1.78:1 anamorphic widescreen format for the first time: some heavy-handed edge-enhancement aside, they look stunning, revealing an almost cinematic quality. Audio is 2.0 stereo (at 192kbps). Most other recent shows are being presented in 5.1 for DVD, so it's a shame that Fox hasn't followed the trend. 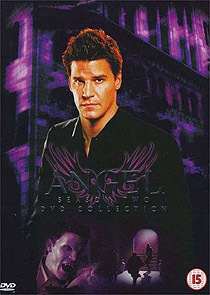 The six discs contain all twenty-two episodes, encompassing several key arc stories involving characters from Angel’s past, culminating with an epic adventure in the Host’s home world, Pylea. The quality of episodes is remarkably consistent, with only a couple of routine stories to mar what is otherwise a very entertaining series. Extras are thin on the ground, and generally rather incidental. Only a couple of episodes have commentary tracks (Minear’s evocative 50s noir episode Are You Now, Or Have You Ever Been and Over The Rainbow, the first episode of the Pylea trilogy). Since the show is still in production, it should be relatively easy for Fox to record more commentary tracks. A couple of featurettes (including one focussing on the monster make-up), a couple of scripts and stills and design galleries complete the offering. The extras are obviously not intended to provide a definitive, studious record of the production, but something less ephemeral would be very welcome. If they need inspiration, they need look no further than MGM UK’s ongoing series of Stargate SG-1 discs.